Martial arts typically classed as “internal” all employ similar, if not identical, methods of power generation. While this power is often couched in flowery, poetic talk and culturally specific idiomatic expressions, there’s nothing other-worldly or supernatural about it. It’s real and tangible personal magic gained through consistent rational practice. If you think you feel it, you don’t. There is no grey area. The cultural symbolic and linguistic barriers make if difficult, if not problematic, when we set out to learn these skills. By shifting our paradigm, and using language that allows us to understand what’s really going on, we can develop these skills much more quickly and truly begin to enhance our performance in the skills required for internal martial arts. This is what it means to be "RMAX Powered" - using the innovative technology, tools and talents to accelerate your practice. In this video series, we will examine these skills through the lens of clarity, brush away the culturally and linguistically obscure terms and in doing so, cut your learning curve dramatically, and supercharge your practice with immediate results! In Volume 1 of this series you will learn the Spinal Articulation and Ground Connection: the essential physical virtues of power generation to "Load, Lead and Launch". The skills you will acquire though this practice will apply to any martial art, internal or external. Regardless of your experience level, beginner or expert, this video course will be an invaluable asset to powering up your practice with RMAX! Brandon Jones has over 20 years of experience as a certified instructor in Chen Taijiquan and Xingyiquan in addition to holding black belts in several other styles, coupled with the sweet pragmatism of being a certified boxing coach and athlete. 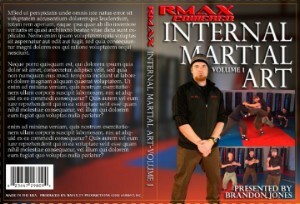 Even though he spent many years training in the internal martial arts, it wasn't until he began training with Scott Sonnon and RMAX that his proficiency and ability integrated into personal mastery. By stripping away the unnecessary mysticism from the internal martial arts, he was finally able to apply the principles in a real environment. To be able to marry the external and internal arts together so that anyone can gain the benefits of both.